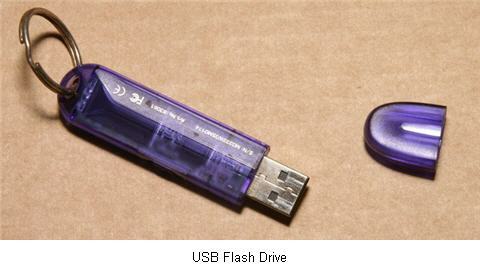 A Flash Drive is a small self-powered drive that connects to a computer directly through a USB port. It’s both Mac and PC compatible, so you can use it to transfer files between both Macs and PCs. Flash drives can hold any type of data, making them an ideal way to back up your files. Even though they are called drives, flash drives differ from hard drives in that they do not have any moving parts inside. Instead, they have a special kind of memory called flash memory that keeps the contents of what is stored on it even when it is not powered. Flash drives come with varying amounts of memory, with some having as much as 1GB or more. Flash drives are also commonly referred to as key drives, thumb drives, jump drives, or just USB drives. The iPod Shuffle music player can also be used as a flash drive. By changing a setting in your iTunes preferences, you can set aside part of the iPod Shuffle’s flash drive to be used to store data files. To change the amount set aside for data, open your iTunes preferences, then in the iPod tab use the slider to change the amount reserved for data.